Create an environment such that people living within the Hospital catchment area use PKMMH as their first choice for health care and are treated with excellent customer care. 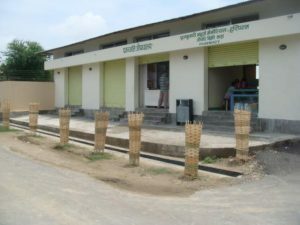 PKMMT established Phul Kumari Mahato Memorial Hospital (PKMMH) in Karjanha-2, Siraha, a 50 bedded not-for-profit community health care facility, to provide quality health care service to the people of Siraha and other nearby districts. 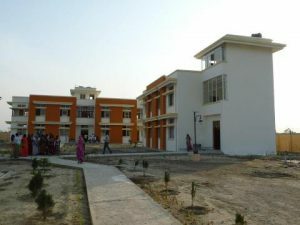 The Hospital was inaugurated by the President of Nepal Dr. Ram Baran Yadav on 4th May 2012. The foundation stone of the hospital building was laid by the then Prime Minister of Nepal Mr. Pushpa Kamal Dahal ‘Prachanda’ on 13th October 2008. PKMMH, with an area of 74,250 sq. ft is one of the most ambitious philanthropic projects of the Phul Kumari Mahato Memorial Trust. Siraha is one of the least developed districts of Nepal and does not have many health and educational facilities. Siraha District is ranked 11th among 75 districts of the country in terms of having the highest Human Poverty Index (HPI) and in terms of Human Development Indicators it is in the 13th lowest position. In terms of Per Capita Income (PCI) Siraha is 12th lowest. Most people of the region are involved in the agricultural sector and health awareness is poor. Being an organization dedicated to the welfare of poor and needy people, the Trust took the decision to establish the Hospital in Siraha district. The Trust has a vision of making Karjanha, Siraha, where the Hospital is located and birthplace of Upendra Mahato, a model village with quality health care, educational and self-employment generation facilities. 848 children below 5 yrs age per 1000 suffer from respiratory diseases, which is the highest among 75 districts. 277 per 1000 suffer from diarrhea. At present, there are only 2 government hospital and 11 health post in the District. PKMMH serves people from the eastern region of Nepal with a focus on Siraha, Dhanusha and Udaypur districts. 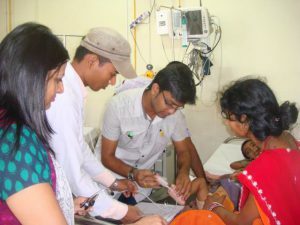 People from India are also benefitted by PKMMH. Nepal 2011 census, Siraha District 118,000 households. There are two major operational areas at PKMMH. These include Medical and Administration. The PKMMH Medical Director manages all Medical Divisions providing direct services to patients. These include doctors, nurses, health assistants, etc. The Medical divisions includes Emergency, Lab, Radiology, Operating Theatre, Dental and Wards. Administration provides support services for creating improved community health. The Primary Health Administrator/Community Outreach Specialist manages all Administrative divisions which includes Finance, Human Resources, Marketing, Store/Pharmacy/Cash Counter, Restaurant, Maintenance, Drivers and Security. Radiology (Ultrasound/200mA X-ray with CR system). 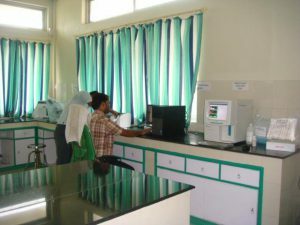 Pathology Laboratory (Biochemical Automatic Hematology, Sodium Potassium and Serum Protein Analyzers). Ultrasound Equipment: ACUSON X300 (Ergo Dynamic) ultrasound system, premium edition. The ACUSON X300 PE supports customizable labeled measurements (20B-mode, 5 Dopper and 5M-mode) for the following exam types; Abdomen, Muskuloskeletal, Breast, Thyroid, Testicle, Venous, Renal, Pediatric abdomen, Neonatal head, Superficial Muskulosketetal, Digital, Small parts and Aorta. X-Ray (Siemens MM15 with Multix Ease & Standix) : The multiphos 15 is a high frequency X-ray generator with an output of 15kw. It is suitable for radiography and fluoroscopy of all parts of the body. 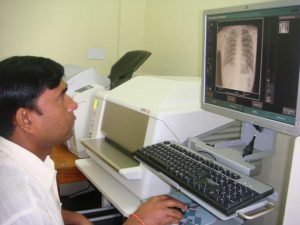 Together with the motorized table Klinoskop H, it forms a complete radiographic system for a diagnostic centre. Connected to a Multix Basic System enables exposures of all anatomical regions as well as for orthopaedic and trauma diagnosis. LSCS, Hernia, Appendicetomy, Hydrocele, Lipoma, Excision of cyst. Circumsion and many other minor and intermediate Operations. Please consult with PKMMH physicians for these needs. Coagulase Profile :BT, CT, PT, PTT etc. Medical treatment facilities specialized in acute patient care without prior appointment. The ER provides initial treatment for a broad spectrum of illnesses and injuries. ER consists of seven beds; including one bed with a cardiac monitor for critical care patients. 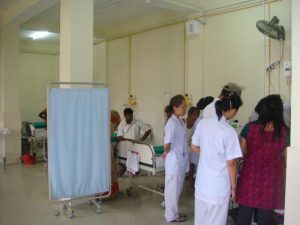 There is also one bed for dressing and orthopedic treatment. ER equipment includes defibrillator for cardiac arrest, pulse oxymeter, suction machine, ECG, nebulizer and central medical gas. At the ER PKMMH provides dressing and suturing, emergency medications, bleeding control set and a glucometer. PKMMH has a branch office providing emergency, lab, pharmacy and OPD services to the area population. Branch hours are 6 AM-8 PM, seven days/week. The PKMMH family restaurant offers a variety of reasonably priced fresh foods, beverages and packaged items to patients and visitors. The Restaurant has free television and internet services for a nominal charge. Hours: 6 AM-8 PM. PKMMH offers a resource centre for the entire family in front of the Hospital, including books, toys, educational games, crayons, plush toys, etc. Hours: Monday-Thursday and Fridays 5 PM-6 PM; Saturdays 11 AM-1 PM. PKMMH practices waste segregation at the source and has a waste management committee, which handles waste as per government rules and regulations. PKMMH is committed to minimize the use of heavy metals or poisonous substances containing elements/compounds, e.g. lead paint, mercury, etc. Organic solid waste is buried in the ground and dry waste is incinerated in an on-site incinerator. Health care /risk waste is collected separately and managed through an autoclave and incinerator. Grey water is discharged into a canal and sewage is discharged through a septic tank and soak pit. The spillage of chemicals is disposed of in a sealed soakpit. PKMMH has established and maintains procedures to identify the potential for and respond to disaster cases, e.g. accidents and emergency situations, fires and earthquake) and for preventing and mitigating the environmental impacts associated with them. PKMMH will periodically test such procedures where applicable. Fire extinguishers, smoke detectors, sirens and hooter are located throughout the Hospital. Provisions for emergency exits and safe zones (open space) are maintained.